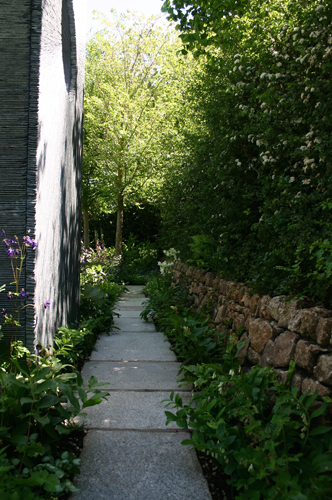 It was a cold, sunny day in February when I first met garden designer Darren Hawkes at a coffee shop on Kings Road. He had come up from Fowey in Cornwall to meet the RHS at The Royal Hospital to view the area he had been allocated by the Chelsea Flower Show organisers for the Brewin Dolphin Garden. Over a frothy cappuccino, Darren explained that he had a dream for Chelsea 2015… that it would be enjoyed by everyone working on it. So much time and energy was to be spent in the creation of his beautiful and striking design that it had to be a great experience. 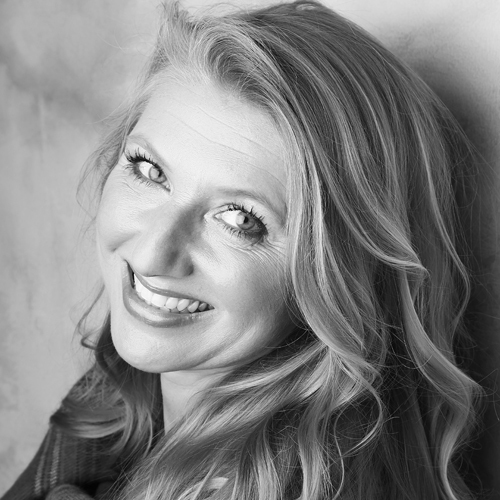 I was to be leading the planting team and working with his landscaping company, Wheelbarrow, and I loved the idea that I would be part of a team where a philosophy of fun would keep stress at bay. Our next meeting was at Kelways in Somerset in early April. Kelways were to supply the plants for the garden and this was an opportunity to see the plants, to look at the planting plan in more detail and to meet another two key members of the planting team. One was a florist from Cornwall who grew all her own flowers and the other a fabric designer from London, both old friends of the designer and very creative. It all started with the underplanting of a beautiful Hawthorn hedge, just coming into bloom, with ferns, foxgloves, white campion (Silene latifolia), and Erigeron karvinskianus. A great way to start ten days of planting, you might think, but the clue is in the name, even with gloves and arms covered, the hawthorn had a way of pulling up your sleeves and attacking your arms to such a degree that it looked as though I had been attacked by a very vicious feline. But it did look beautiful once finished the following day! of the larger shrubs and specimen Euphorbias into place and the landscaping team dug out and backfilled the soil across the garden so that the varying levels were accurate and ready to plant. We had several floating platforms and steps that were to be underplanted with ferns (mainly Asplenium scolopendrium) and a great ground cover ivy, hedera helix ‘Ivalace’, and this had to be completed quickly so that we could get on to planting around them. We also needed to finish planting the stone walls and the margins below them. 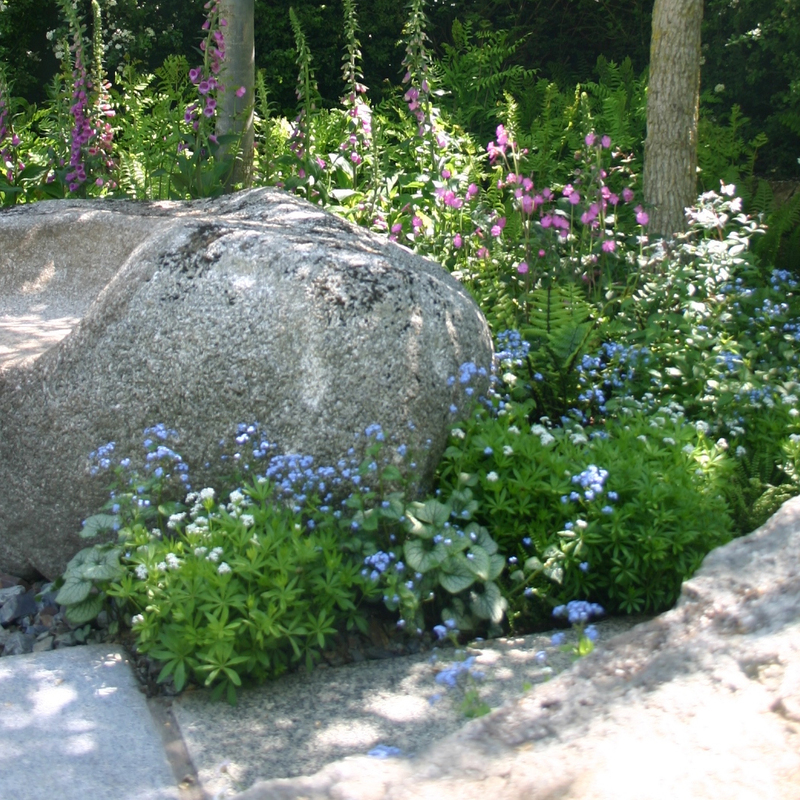 Tiny ferns were squeezed into the gaps between the stones in the shade and tiny plug plants of Erigeron karvinskianus in the sunnier spots, together with pink and white valerian (Centranthus). By Monday we were ready to start on the main areas that would make or break the design. The rest of the team arrived and a selection of our chosen plants arrived from Kelways. We started in the shade at the back of the garden with a fantastic selection of plants to work with. You always fall in love with a few plants when you do a show garden, most of them you know already, but it’s a bit like bumping into an old friend that you haven’t spent enough time with over the years, and when you meet them again, you realise how much you loved them and can’t quite believe you left it so long. My rekindled friendships in the shady parts of the garden were with sweet woodruff (Galium odoratum), Lamium maculatum ‘White Nancy’, lily of the valley (Convalaria majalis), Brunnera macrophylla ‘Jack Frost’ and the common and white foxgloves. 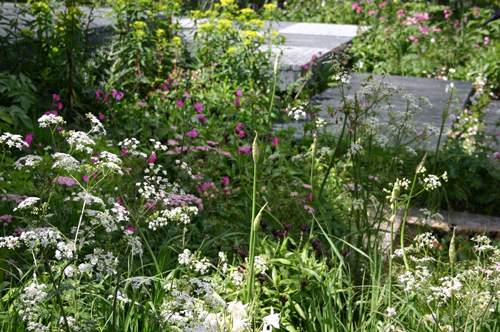 The planting style was to be natural, evoking feelings of wonderment and enchantment. We were trying to create a landscape where the plants looked like they had self-seeded and spread naturally, but not crowded each other out. A delicate balance! It all seemed to be working… everyone was pulling together as a team, we were all having fun, creative ideas bouncing around and producing lovely planting combinations. With four days to go the garden was really starting to come together! We had completed the shady woodland areas and were ready to move into the sun, just in time for the weather to change with a vengeance. On Thursday, the rain came. We battled all day, trying to keep the plants from getting damaged and keep to schedule, but we called it a day at 5pm, the first early finish since we had started planting and prayed for the sun to return on Friday so that we could make up the time. The gods of gardening were on our side and at 6.45am the next day when we were queueing for the gates of the Royal Hospital to open so that we could assess the damage, the sun appeared and didn’t leave us until the garden was finished. 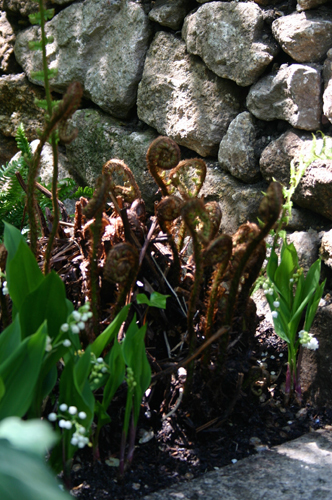 I met up with some more old friends and made some new ones when planting the front of the garden in the sun. This picture shows some of them: Cow parsley (Anthriscus sylvestris) and the pink cow parsley (Pimpinella major ‘Rosea’), planted with Geranium phaeum album, Centaurea montana ‘Black Sprite’, Nectaroscordum siculum and Euphorbia ‘Goldener Turm' in the background. Euphorbias were in abundance on the garden, some to look out for are Euphorbia ‘Blue Haze' and Euphorbia cyparissias ‘Fens Ruby’, both beautifully compact and delicate. Euphorbia x pasteurii is a shrubby form, growing up to 8ft tall and well worth hunting out. We finished planting at 8.30pm on Sunday, 17th May when the judging process was in full swing. My personal total was 106 hours. The assessors were visiting to make their recommendations to the RHS judges who were due on the Monday. Any medals would be awarded after 7am on Tuesday! It was a torturous wait, we had done everything we could, but as all keen gardeners know, there is no such thing as a ‘finished’ garden! ‘GOLD’ was the text I received at 7.08am the next morning, the best news! But for me, the icing on the cake was when Monty Don said to Darren Hawkes during the coverage of the Flower Show on the BBC, ‘I love your gentle planting!’. Thank you, Monty! Early human settlements away from rivers or lakes relied totally on natural springs and wells for their drinking and washing water. Many of us now are lucky enough to have natural wells in our gardens. Some, like us, have a well with no natural spring. Water in this fluctuates through the year dependent on the weather and the saturation of the ground. Not good for drinking or washing but the perfect excuse for a decorative well cover in the garden. Not that an excuse is needed though. The more ornate, decorative stone ones mostly come from the Continent – particularly from Italy. They have their own beauty but to my mind the rarer British ones have more character. We have, in the past few years come across British well covers in several different guises. The first one we owned was from Yorkshire. A simple stone well head hand cut from local stone. A very special item of considerable age . You could feel the age and the work of this well. The smooth areas where the bucket had been rested over and over. Very tactile – you just wanted to feel it. This year we have had two more, vastly different well covers. The first we still have and we might yet keep for our well in the lawn. This one is possibly medieval in age. It has been hand cut from local stone and was probably made on and for the farm estate that it came from in east Cheshire. At a later date crests have been carved out of it depicting the wheat emblem of Cheshire. Again this oozes its age and history. It would have had a simple wooden overthrow and handle originally not the more ornate metal one it currently has. A fine English wellhead though. The other was by far the most intricate and ornate of the well covers we have found. It was originally made for The Great Exhibition of 1851 at Crystal Palace and it was a real pleasure to have owned such an item. 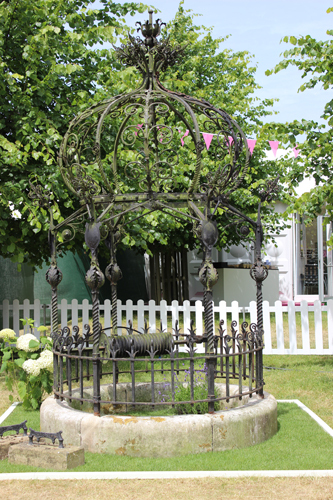 Made in wrought iron and displaying the wonderful craftsmanship of the Victorian era, this well cover was at Lynford Hall in Norfolk for most of its life until the land was sold prior to the war to the Forestry Commission. With it went this well cover. Since then it has formed part of two private collections before coming to us. A truly stunning piece of metal art in incredibly good condition. A piece of our history. 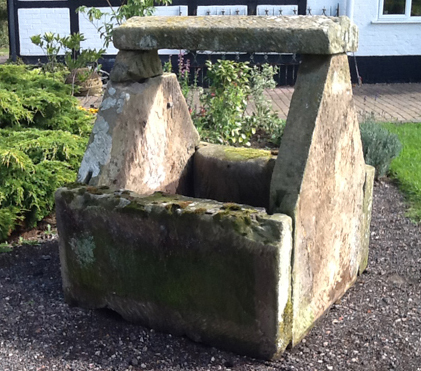 There is nothing like a staddle stone for adding a depth to a garden or new area in a garden. They hold the space as if they have always owned it. The solid local native stones just belong wherever they are placed. They are also full of character, lichens and mosses. We currently have several substantial pale limestone ones and two lovely large craggy Cotswold stone ones – a warmer golden colour. They are listed under Statuary (for some reason!) in our Current Stock area on the website. Gardeners love our range of sturdy 12mm mild steel plant supports:- herbaceous supports, arches, obelisks, rose cages, stakes.